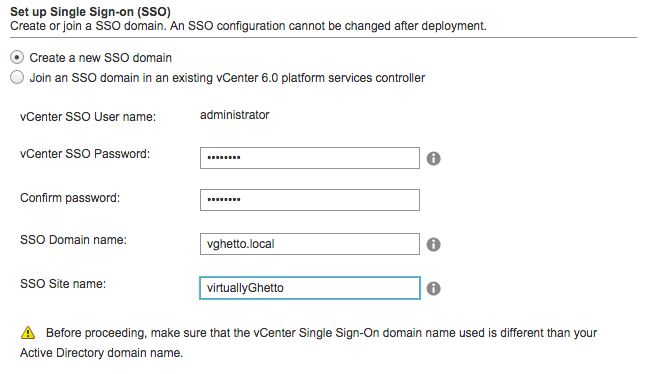 You are here: Home / VCSA / vCenter Server 6.0 Tidbits Part 2: What is my SSO Domain Name & Site Name? When deploying an Embedded vCenter Server or an external Platform Services Controller, one of the configurations you will be asked for is the vCenter Single Sign-On Domain Name and Site Name as seen in the screenshot below. In addition to troubleshooting, you will also need to know about the SSO Domain Name + Site Name if you plan on deploying additional Platform Services Controller for replication purposes or additional vCenter Servers. It is important to note that you do not need to know this information explicitly when deploying using the new Guided UI Installation. You just need to know the hostname/IP Address of your PSC as the rest of the information will automatically be obtained by the tool. The issue only arises when you are trying to perform a Scripted Installation and this is where you will need to provide both the SSO Domain Name and Site Name and below are the instructions on retrieving this information. First off, you will need to login to your Platform Services Controller whether that be on a Windows Server or the VCSA. For more details, check out my previous blog post: vCenter Server 6.0 Tidbits Part 1: What install & deployment parameters did I use? "C:\Program Files\VMware\vCenter Server\python\python.exe" "C:\Program Files\VMware\vCenter Server\VMware Identity Services\lstool\scripts\lstool.py" get-site-id --url https://vcenter60-6.primp-industries.com/lookupservice/sdk"
As you can see the process to find the SSO Site Name is not really intuitive, but I know Engineering is aware of this and has plans to simplify this in the future. Major respect for this blog! I am wondering exactly what the SSO Domain Name is good for, why it is used and what domain name I _should_ give to my sites. Does it mirror Active Directory? If you use the same domain name for SSO and your AD, you won´t be able to create an Identity Source out of your AD once your vCenter is deployed. Actually, look at the screenshot at the beginning of the post; it tells you explicitly not to do it. I just upgrades my vcsa from 5.5 to 6 and I noticed that there was no Single Sign-On site option in the wizard. How van I join the updated vcsa to the new SSO site? You will need to either use the new Guided UI Install or Scripted Install, both of which are inside of the VCSA ISO. Take a look at the vSphere 6.0 documentation for more details. You’re actually referring to the IP Address of your PSC, not the SSO Domain Name (which is different). I’m not sure I understand ! On one of my upgraded vSphere 6 labs the lookup service or SSO server hostname returns as a short name, not an FQDN. Do you know if and how I can change that to an FQDN? I had a quick question in regards to PSC. If you need 2 Platform Services Controllers (PSC) to replicate between one another, do you need a Load Balancer? I guess, I am a bit confused reading the deployment paper from VMware as to Load Balancer. My ultimate goal in this is, to have 2 PSC running, and if one crashes, you point the 2 Vcenters to the other PSC. I hope the question is clear…. PSC replication does NOT need a load balancer, as long as it’s joined to the same SSO Domain, then replication is done automatically. Most usefull as always! Thank you! Weird… /usr/lib/vmidentity/tools/scripts/lstool.py doesn’t exist in my VCSA. I just downloaded V6 Update 2 and when I try to run this command I keep getting command not found, any idea why? Then your other PSC is most likely not part of the same SSO Domain, else it would be visible if you configured it as a new Site. Really good information thank you. I want to consolidate 2 SSO domains into 1 as part of a 5.5->6.0 vCenter upgrade. Is there hope? 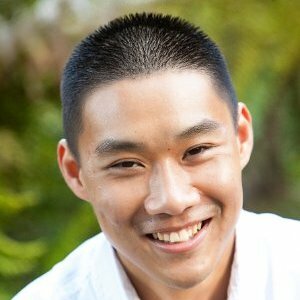 Any suggestions for process or documentation? Regarding SSO domain setup (PSC) on a recovery site for use of SRM 6.x, can I join to an existent SSO domain or this answer only depends on wan link latency? I have difficulties with these two concepts: SSO Domain Name and SSO Site name. Anyone can explains me the differences between them and why are so importants when I must upgrade/migrate my farm vs ver 6.0? I must upgrade my farm 5.5 to ver. 6 next month (8 vCenters), and I don’t know how these parameters must be configured. Hi, is there anybody else who got a problem with an SSO Domain name? it works perfectly with the AD, but if I try to use this for SSO-Domain in vsphere-Setup i get errors. I’m note able to add the Applaince to the AD (without getting an error – just not possible) or with the VIM-Setup on Windows 2012 R2. Hello William, I have a customer who has accidentally given the same name to the SSO domain as his AD. Is there a supported process to update the SSO domain after the PSC has been deployed. This is vC appliance 6.5 with embedded PSC. I ask this because redeployment is going to be a difficult task given the current state of deployment.